For more than a century, Boston Marathon runners have laced up their sneakers to make the landmark journey amidst cheering fans. But for the past three years, in the dead of night mere hours before the run starts, a small group of locals have experienced the route differently. No winner, no television coverage, no water cups littering the side. And, most notably, no running. Since 2009, Greg Hum has traversed the route on his bicycle, beginning at midnight in Hopkinton on the eve of Marathon Day. Hum said the idea of biking the route came to him and his friends in 2008 while they were hanging out on the Boston University campus, where he was then a sophomore. Hum started a Facebook event and told a few friends to spread the word. 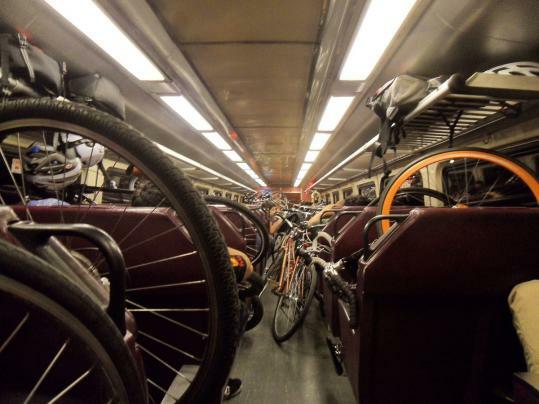 On Marathon Day in 2009, about 70 people showed up with their bikes to catch the last Sunday night train to Hopkinton out of Boston’s South Station. The first two years saw a modest turnout, Hum said, but when the Boston Societies of Spontaneity, the organization responsible for annual pantsless T rides and other pranks, approached Hum last year to help promote his event, attendance soared. “Now 2,000 people knew about it rather than just a few hundred, so over 220 people came to South Station just for the midnight ride, along with about 30 more along the way on the commuter rail,’’ Hum said. Josh Nemzer, a Boston Marathon spokesman, said marathon officials are aware of cyclists using the course and have reached out to the biking community to ensure that riders clear out by 7:30 a.m., which is when road closures start. “As long as they’re not getting in the way, it’s absolutely fine,’’ Nemzer said. Hum said avid bike riders enjoy the route, where markers are already in place for the morning run. Hum described the 26.2-mile stretch winding through the western suburbs, which takes two to three hours for most bikers to complete, as a tranquil yet invigorating ride. Hum said that residents from local towns west of the city also join the Boston-based group on the commuter rail. “People who are in the suburbs hear about it and say, ‘I don’t live in Boston, but I can catch the commuter line with you guys,’ ’’ he said. Hum said he expects at least 300 people to meet at South Station this year, piling their bicycles onto commuter trains. He said he thinks more bikers have grown interested in the midnight ride due to last year’s added promotion, as well as an increase in biking awareness in both Boston and the suburbs. “As a sophomore in college, I was one of the brave few for riding bikes around in traffic, and now four years later, all my friends are riding bikes,” Hum said, adding that it proves a viable option for students when the T shuts down by 2 a.m.
“The trend for biking in Boston is on the up and up, and that’s a great thing,’’ he said. Hum’s opinion reflects major changes in the city over the past few years. With the introduction of the Hubway bike sharing system last year and the city starting to dole out funds for bike lane and rack installations, more residents are opting to use the alternative transportation mode. According to city officials, Boston added its 50th mile of new bike lane in the last year, including a crucial stretch of Massachusetts Avenue, and hopes to add 15 to 20 more miles this year. Additionally, the Hubway sharing service has already proved extremely popular, with some 142,000 trips across Boston on Hubway bikes in the first year. And since March 15, 15,000 rides have been logged on Hubway bikes, which now has 5,000 members, a city spokesman confirmed. And as Boston continues to improve its roads and sharing systems for cyclists, suburban residents are also starting to catch the biking bug. Hopkinton and Holliston received state grants last summer to improve walking and biking trails, and Hopkinton also gained state support to expand pedestrian and biking walkways on the Route 85 bridge over the Sudbury River near Southborough . Natick has also received grants from the Metropolitan Area Planning Council to install bicycle racks in parks and schools, and has added large shoulders to major reconstructed thoroughfares such as Route 135, said John Magee, chairman of the town’s bicycle and pedestrian committee . Magee said the suburbs are experiencing a kickback of biking enthusiasm due to increasing awareness in Boston. “People who work in Boston see that there, and when they come home to Natick and the MetroWest area, they start biking around more, too,’’ he said. Matt Marx, a 41-year-old Massachusetts Institute of Technology professor who also rides the marathon route, is a living example of Magee’s theory. Marx said he has cycled from his Westwood home to work in Cambridge every day - a little over 13 miles each way - for the past two years. “It’s faster than taking the commuter rail to the Red Line and then walking, and it’s way faster than driving through rush-hour traffic,’’ Marx said. He said he prefers to ride in the city, as Westwood has made minor improvements for bikers, but not enough for him to enjoy cycling there. “They have installed a couple bike racks in town and they have done traffic studies, but I do most of my riding in Boston,” Marx said. Still, he looks forward to this year’s marathon ride, adding his own challenge of riding the route both back and forth for a total of almost 53 miles. “It’s serene, quiet, and you really get to enjoy what you’re doing,’’ Marx said.